Delicious cinnamon-raisin coffee cake - yum! The idea for this cake came from Coffee Cakes - Pound Cakes and Dessert Cakes by June Kessler (not sure why the title at Amazon doesn't match the book cover) but my modifications make it very different, I’m sure. First off, the directions in the book clearly say to mix flour into the topping but there is no flour listed in the topping ingredients, so I left it out. Afterward, I realized that it should have been there to make the topping crumbly but my adaptation got an average score of 8.75 from my two raters so I think I may have improved it. My other changes include reducing the sugar and cinnamon, substituting baking soda and cream of tartar for baking powder (we’re out), and using sugared raisins I harvested from raisin bran cereal (hence the sugar reduction). Then I opted to spread all the batter into the pan and put the topping on top. (Hmm. Isn’t that where topping is supposed to go?) The original recipe has you layer the topping with the batter but that was just too convoluted for me! 1. Combine flour, baking soda, cream of tartar, salt and sugar. 2. Cut in shortening with a pastry blender until blended. 3. Combine egg, milk and vanilla and add to flour mixture. Stir until just blended and set aside. 4. Stir brown sugar, cinnamon and raisins into melted butter. 5. Spread batter in greased 9-inch round pan. 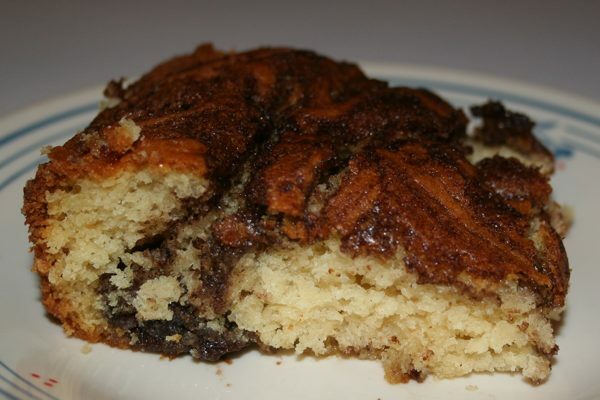 Dot top with raisin mixture and slightly swirl into batter with a knife. 6. Bake 25 minutes at 375 degrees F.